Marvel Studios recently released the very first set photo from its Ultimate crossover movie Avengers. Yes, it is not much. There is no actors on the photo, but tell me are you really not geeking out on this set photo? When I first saw this photo, I was just "Oh my God! This is really happening now!" The chairs are ready and the set are beautifully done. I can't wait to see more. Starring Robert Downey Jr., Mark Ruffalo, Chris Hemsworth, Samuel L. Jackson, Chris Evans, Jeremy Renner and Scarlett Johansson. 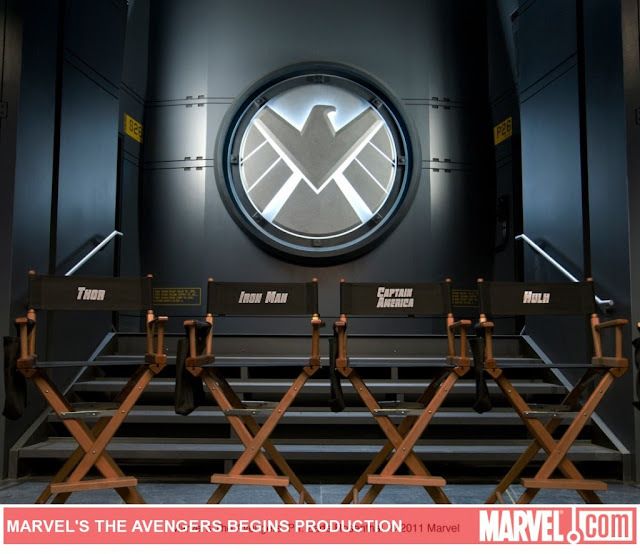 Directed by Joss Whedon, Avengers are set to assemble on May 4, 2012 from Marvel Studios to be distributed by Walt Disney Pictures.